GFTMA have developed tools for nearly total speech control and deployed them against conservatives and other opponents of the Left. They tied themselves to the Left under the Obama administration. The political censorship and discrimination against the “right of left” authors and readers is well documented. This article focuses on the scientific and technical human potential of this country, a large part of which is computer and network engineers, scientists, businessmen, and other specialists affected by Silicon Valley. One expects that the experts can freely discuss public interest topics, at least the ones that are far from the current leftist obsessions. Cyber-security and attribution of cyber incidents is one of such topics. Unfortunately, this topic touches on the (mis-) attribution of the 2016 DNC leaks to Russia, which is off-limits, just like the climate debate. GFTMA act as consensus enforcers. GFTMA have huge power. In addition to owning vast fortunes, they’ve been granted the role of internet gatekeepers. For eight years they were allowed to operate above the laws, especially antitrust laws. Consequently, almost every internet or computer company, from tiny startups to large corporations, must do business with at least one of GFTMA, usually more than one. GFTMA are leftist corporations. On top of that they employ hordes of radical vigilantes. These vigilantes can sabotage relations even with customers and vendors to whom the management would not object. I can understand professionals and businessmen who decide that the only way to stay safe in this environment is to go with the flow by staying put or even joining the radicals. One hidden source of the GFTMA power is the power of networked platforms. An example of a platform is Microsoft Windows. The majority of desktop and laptop computers shipped in the last quarter century ran Windows, so most desktop software vendors sold software for Windows. Apple had a strong presence in the publishing industry and its vendors shipped one version for Windows and another one for Apple Mac. In the past, no vendor had to ask Microsoft or Apple for permission to sell its software to the user. That has changed with the rise of Apple iPhone. Today, a vendor of an iPhone app must ask Apple for permission! An iPhone user can get an app only through the Apple Store. Apple routinely rejects apps for purely technical reasons. Only in some cases does Apple rejects an app for political content or position. In 2015 and 2016, Apple rejected a game that contained a mild satire of Hillary Clinton, while accepting multiple games smearing Donald Trump. Apple accepted that game after intervention by Breitbart. Now Apple has banned Gab. We don’t hear of many such cases because just a couple cases send a clear message. The mere threat of rejection by Apple (or by a vigilante employee) is enough to stifle the speech of any individual or company that develops or considers developing iPhone apps. Respectively, most Android phone users get their apps from the Google Store, so the vendors must be approved by Google. Most app vendors need to sell versions for both iPhone and Android. Apple and Google compete over the smartphone customers, but each of them has monopoly power over content-intensive app vendors. Smartphones is just one example. GFTMA control multiple networked platforms and network services including financial ones. Typically, a platform service is a monopoly of one of GFTMA, or an overlapping monopoly, like in the described case. GFTMA exercise discretion in granting access to their platforms and deny or even shut off access for political reasons. For example, Google banned my AdWords account after the NY Times interviewed me and demanded that Google stop giving voice to “climate deniers.” And almost everyone in the tech eco-system depends on GFTMA or related entities as potential acquirers, investors, or partners. Of course, having one’s business rejected is not the same as being thrown to Gulag. Nevertheless, such risk is enough to discourage working experts from speaking on controversial subjects. A professional has nothing to gain from speaking up but risks losing a lot because of GFTMA. The victim wouldn’t even get support from his or her peer group. GFTMA deny political discrimination and frequently defame their victims as racists, harassers, terms violators, etc. I think that this speech-stifling effect is somewhat contagious – people see that their peers don’t stick their necks out and they adopt the same posture. GFTM (excluding Apple) yielded to Berlin’s pressure in 2015, and to Brussels’ in 2016, and signed a consent to censor “illegal hate speech.” GFTMA don’t want to recognize national borders, so they brought the rule of Berlin and Brussels to the U.S. They hired tens of thousands of censors and created whole censorship departments, sometimes named Trust and Safety. LinkedIn currently lists more than 100 thousand Trust and Safety job openings in Google (probably including filled positions and mismatches). Without much public attention, GFTMA turned into censorship companies. When later pressed by Angela Merkel to remove “fake news,” they were glad to oblige. For years, business experienced a pressure to “increase diversity.” Although tech companies employ people of all skin colors from all corners of the world, the Obama administration had other ideas about diversity. The “future president” Hillary Clinton was expected to ratchet the diversity demands. This pressure has probably caused the Big Tech to staff HR departments with SJWs. SJWs hired more SJWs and vigilantes, who use their power to sabotage vendors and partners who are associated with dissidents. SJWs call themselves progressives and frequently approach separate political issues not as separate issues, but as part of the Grand Fight between progressives and their enemies. Whether it’s climate, gay marriage, or cyber incidents attribution, a stereotypical progressive can identify progressive and anti-progressive positions, mark opponents as adversaries, and to attack them or to call in the mob. Today, disagreeing with progressives on one topic might make the person an enemy and a target of all the Left. A few days ago, Breitbart published a leaked video of the Google leadership meltdown at the all-hands meeting following Trump’s victory in 2016. All Google leaders that spoke were strongly anti-Trump. Google’s comment that “Google employees and executives expressed their own personal views” is totally misleading. Google’s management expressed not only deep hostility toward Trump, but also the expectation that this hostility is or should be shared by all the employees. This attitude left no space for dissent or even moderation and removed all barriers to radicalization. Google employees started wearing Antifa T-shirts. Later, Google fired James Damore for penning an internal memo Google’s Ideological Echo Chamber. His lawsuit and a Breitbart inquiry revealed more of the toxic Google internal environment: threats against Trump supporters, internal blacklisting of political dissidents, employees wearing Antifa T-shirts at work etc. Even WaPo complained about Google in an article Google is coming after critics in academia and journalism. It’s time to stop them. It did not happen. Google easily bought them off with little money and clicks. Around 2006, Google, Apple, and some other tech companies entered illegal agreements to reduce competition in hiring. They compiled and exchanged lists of key employees, agreed not to call the persons on these lists, notified each other of hiring competitor employees, etc. The extent of that collusion is unknown because the Obama’s DOJ settled the antitrust lawsuit in 2010 without sanctions. The offenders promised to stop this practice. That might have empowered GFTMA to collude and to secretly blacklist people without fear, except for the fear of Trump. I don’t know whether GFTMA blacklist dissidents secretly, but modern technology allows blacklisting in plain sight. Google and Microsoft search engines promote negative information and de-rank positive information about their opponents (such as Representative Gohmert, R-TX – screenshots) and dissidents (practically all climate realist scientists). For example, if you google me — Leo Goldstein scientist or Leo Goldstein software engineer — the top results describe me in words that I don’t want to repeat, and link to an obscure blog of a government contractor in Australia elaborating on this description. This is intended to be the first (and, probably, the last) impression of me that a prospective hiring manager, business partner, investor, or federal prosecutor would have (screenshots). GFTMA have enjoyed impunity since the early Obama years, but impunity is not immunity. In addition to antitrust laws, they should be held liable for fraud on consumers and shareholders, various torts, and other causes of action common in the litigation and prosecution of big corporations. Most of them allow private lawsuits and class actions. GFTMA operate far beyond protections of the Section 230, but not even close to the protection of the First Amendment. In response to the continuous attack of the left on “corporations,” conservatives and libertarians reflexively defend them. But some corporations are indeed bad. GFTMA are among the worst ones. Their power is augmented by Mastercard (MA), which fashions itself a tech company, and belongs in the same group. A political campaign transparency law requiring disclosure of political campaign donations starting with $100; the law passed in early 1970’s, when this threshold was income equivalent of about $900 today. LinkedIn allows unhinged activists and foreign agents to find who works where. Twitter allows them to spread information about targets and to organize boycotts or even more sinister activities, and with plausible deniability. In addition to technology, GFTMA are assisted by an army of volunteer informers and groups like SPLC. It’s obvious that positions that allow the persecution or silencing of opponents attracts people who have agendas requiring the persecution and silencing of others. In the absence of opposition, such people can take over whole countries not just corporations headed by introvert computer scientists that thrive in low conflict environments. In 2015, Germany pressed Facebook, Twitter and Google’s YouTube to sign up to a code of conduct, which included a pledge to delete hate speech from their websites within 24 hours. 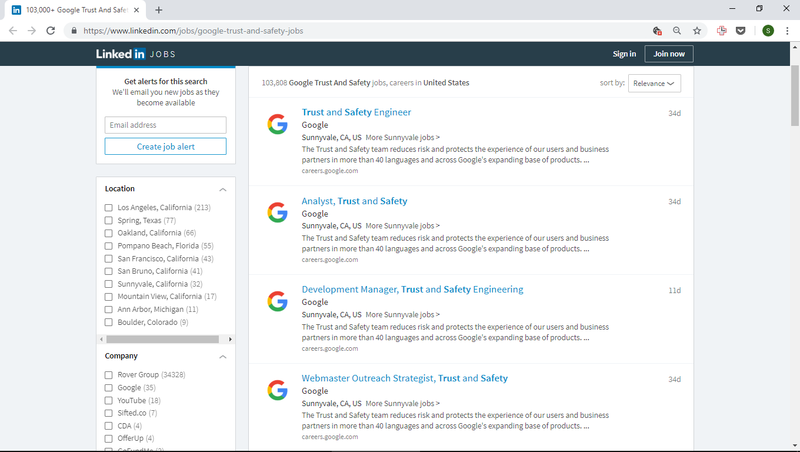 This is a screenshot of a LinkedIn search for Google Trust and Safety jobs. The real number is much less than 100 thousand. I live in Silicon Valley. It’s like living in Orwell’s dystopian “1984”. The whole state of California is like this. I was born in this state before WW2. My mother, also a Calif. native, used to say that it was “all these people from out of state that ruined Califirnia”. I tend to agree with her. I’ve seen it’s steady decline since the end of WW2 and the influx of millions of non-natives. These people come with an agenda and it’s not the welfare of California. There are times when I’d like to leave and move to a red state, but, hell, I was born here. Why should I move, I’m not the interloper. Besides, this state needs as many clear thinking people as it can get to combat all the lies such as global warming.